Retype information 30 times faster than manually. Capture words, sentences, paragraphs, from any printed material into your computer. Excel, Word, PowerPoint, Outlook, … you name it! If you can type it in, you can scan it in with the IRISPen™. Extensive foreign language support enables it to accurately recognize an incredibly vast number of foreign languages. 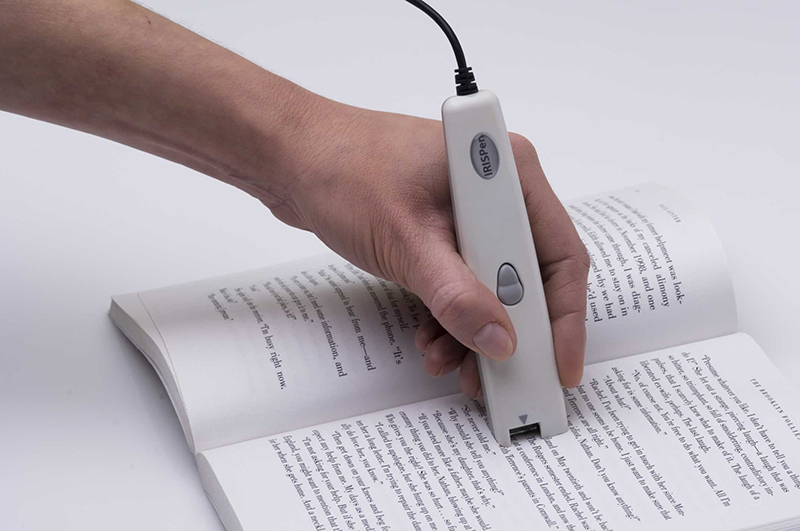 The smallest pen scanner ever designed for text recognition. Easily use the pen button instead of the keyboard to Enter, Tab, Space, etc. Easy to install, powered by the USB port, no need for an external power supply. Capture words, sentences, paragraphs from any printed material into your computer. Excel, Word, Emails, Text Edit, Page, … you name it! 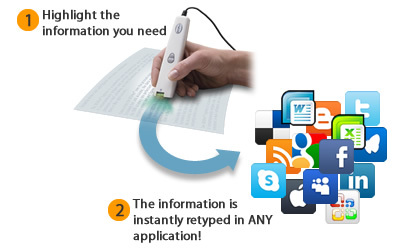 If you can type it in, you can scan it in with the IRISPen™. 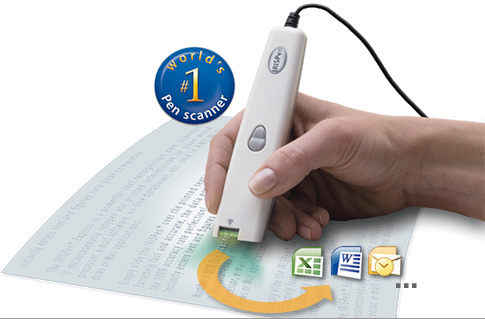 Logos, signatures, and any small graphics are quickly scanned into your document! Text, numbers or small images? Whatever you need to scan, the intuitive wizard guides you in the process. Easily create a user profile according to your retyping needs. Customize it the way you like it! Scan text in one of 11 language pairs available for translation and get instantaneous language conversion in your application. The IRISPen recognizes 128 different languages. All American and European languages are supported, including Central-European languages. Greek, Turkish, the Cyrillic (“Russian”) and the Baltic languages and Hebrew* are also supported. Optionally, the IRISPen reads Hebrew & Asian documents in Japanese, Simplified Chinese, Traditional Chinese and Korean with the Asian edition . List of the recognition languages: American English, British English, Spanish, French, Italian, German, Dutch, Afaan Oromo, Afrikaans, Albanian, Asturian, Aymara, Azeri (Latin), Balinese, Basque, Bemba, Bikol, Bislama, Bosnian (Cyrillic), Bosnian (Latin), Brazilian, Breton, Bulgarian, Bulgarian-English, Byelorussian, Byelorussian-English, Catalan, Cebuano (also called “Visayan”), Chamorro, Corsican, Croatian, Czech, Danish, Esperanto, Estonian, Faroese, Fijian, Finnish, Frisian, Friulian, Galicain, Ganda, German (Switzerland), Greek, Greek-English, Greenlandic (also called “Eskimo” and Innuit”), Haitian Creole, Hani, Hiligaynon, Hungarian, Icelandic, Ido, Ilocano, Indonesian, Interlingua, Irish Gaelic, Javanese, Kapampangan, Kazakh, Kicongo, Kinyarwanda, Kurdish, Latin, Latvian, Lithuanian, Luba, Luxemburgh, Macedonian, Macedonian-English, Madurese, Malagasy, Malay, Maltese, Manx (Gaelic), Maori, Mayan, Mexican, Minangkabau, Moldovan, Mongolian (Cyrillic), Nahuatl, Norwegian, Nyanja, Nynorsk, Occitan, Papamiento, Pidgin English (Nigeria), Polish, Portuguese, Quechua, Rhaeto-Roman, Romanian, Rundi, Russian, Russian-English, Samoan, Sardinian, ScottishGaelic, Serbian, Serbian (Latin), Serbian-English, Shona, Slovak, Slovenian, Somali, Sotho, Sundanese, Swahili, Swedish, Tagalog, Tahitian, Tatar (Latin), Tetum, Tok Pisin, Tonga, Tswana, Turkish, Turkmen (Latin), Ukrainian, Ukrainian-English, Uzbek, Waray, Welsh, Wolof, Xhosa, Zapotec, Zulu. Mixed alphabets: You can activate a mixed alphabet of Greek or Cyrillic and Western characters. This is useful if Western words pop up in Greek of Cyrillic texts (this is often the case with proper name, brand names, etc.). The IRISPen will automatically switch languages whenever needed. For visual mapping, outlining, writing and making presentations, use Inspiration® 9, the ultimate thinking and learning tool. Brainstorm ideas, structure your thoughts and visually communicate concepts to strengthen understanding with the Diagram and Map Views. To take notes, organize information, and structure writing for plans, papers and reports, use the integrated Outline View to focus on main and supporting ideas and to clarify thinking in written form. With Inspiration’s Presentation Manager, transform your diagrams, mind maps and outlines into polished presentations that communicate ideas clearly and demonstrate understanding and knowledge. Create webs, idea maps, mind maps, concept maps, graphic organizers, process flows, and other diagrams for thinking, organizing and writing. Use these proven visual thinking and learning techniques to brainstorm ideas, explore and explain relationships, and integrate new knowledge with what you already know. Inspiration® encourages deeper, more critical thinking and that improves creativity, comprehension and retention. Brainstorm and capture ideas quickly with RapidFire® tool. Print your slides in various formats (with or without speaker notes) for handouts including 3×5 and 4×6 cards.